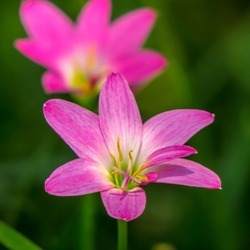 Zephyranthes (“Rain Lily”), also known as “Fairy Lily” or “Zephyr Lily,” produce 2" Crocus-like blooms which open out into stars, especially after a late-summer rain. Borne singly on 1-1½’ stems. Good for rock gardens. For planting in the garden bed choose Candida or for pots Citrina or Robustus. Reported to be deer-resistant. Zones 7-10 and down to Zone 5 for Candida. Great in mass plantings or in the water garden. Zephyranthes Candida is white with a green throat, sometimes with a flush of pink. 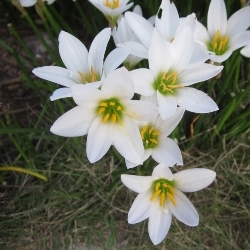 Unlike the other Zephyranthes, its foliage is evergreen. One of the hardiest – it’s been known to thrive year long as far north as Zone 5. Does best in partial shade to full sun with a moist well-drained soil mix. Clumps freely or self-sows from seed. Bright yellow color is a standout. 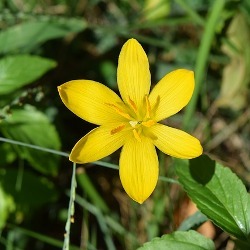 Zephyranthes Citrina’s bright golden yellow flowers are goblet-shaped. It re-seeds nicely and will go through several bloom cycles through the summer, blooming a couple of days after a good shower. The color of the blooms make them very noticeable, so they are best experienced in groupings. One of the easiest Zephyranthes to grow in the hotter drier gardens of Texas. Ideal for rock gardens and for tucking into groundcovers. Zephyranthes Robustus flowers are erect and clear pink with deep glossy green grass-like leaves. One of the most prolific of the summer flowering Zephyranthes, they continuously bloom in waves from late summer to early fall. Where not hardy, Zephyranthes are easy to cultivate in pots, which you can move indoors after the first frost and allow to dry out. In the spring move them back outside again and water. 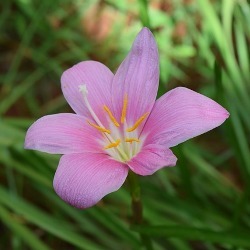 Zephyranthes Rosea, commonly known as the Cuban Zephyr Lily or the pink Rain Lily, has soft pink, upfacing flowers with yellow stamens and a small white throat. It blooms later than many others. Lovely little beauties for the front of the garden. A mixture of the above Zephyranthes – Robustus (pink), Candida (white) and Citrina (yellow). A collection of 25 each of Robustus, Candida and Citrina Zephyranthes Lilies. Packaged separately.